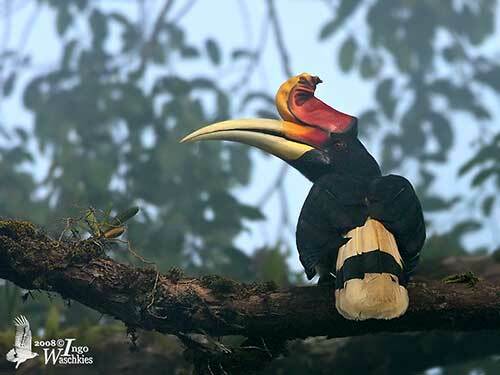 The Rhinoceros Hornbill is the Malaysia’s National Bird. It can be found in Borneo, Sumatra, Java, the Malay Peninsula, Singapore and S Thailand. It frequents the primary evergreen forest, but it can be seen in more open habitats. The Rhinoceros Hornbill is one of the largest hornbills, and it can live for up to 90 years in captivity. It lives in treetops and feeds on fruit, insects and small vertebrates. They are monogamous with long-term pair bonds, usually for life. The Rhinoceros Hornbill is threatened by forest destruction and hunting for food but also for its feathers. The species is currently considered Near Threatened. 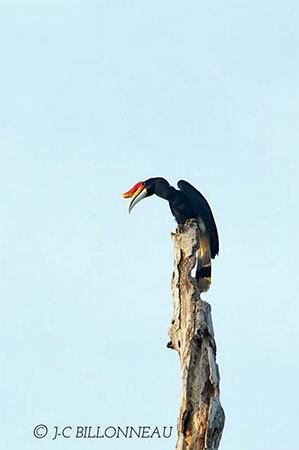 The Rhinoceros Hornbill has mainly black plumage overall, except the white vent and thighs. The white tail is crossed by broad, black band. The conspicuous casque is made of keratin and is hollow inside. It probably plays a role when the bird is calling by serving as a resonator for the sounds. The ivory bill and the casque are coloured orange, yellow and red with black base. The bird rubs both bill and casque against the uropygial gland placed at the base of the tail, gradually involving the red-yellow-orange colour of the adult’s bill. The eyes are red surrounded by black eyering, and protected by long lashes. Legs and feet are black. The female resembles male but she is smaller. The casque is smaller too and lacks the black base. She has white eyes surrounded by bare, red eyering. The juvenile has smaller bill without casque. The eyes are blue-grey. The Rhinoceros Hornbill has three subspecies. B.r. rhinoceros (described above) is found in S Thailand, Peninsular Malaysia and Sumatra. B.r. borneoensis occurs in Borneo. This race is smaller. The casque is broader and more sharply recurved at tip. B.r. silvestris is found in Java. This one has broader black band on the tail. The casque is usually not rolled back. 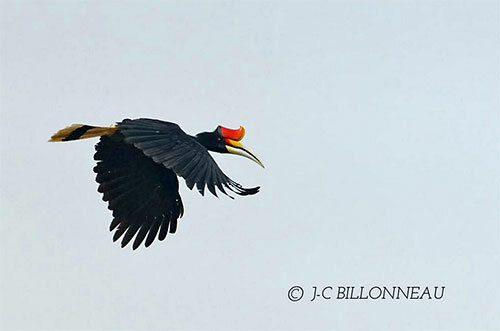 The Rhinoceros Hornbill frequents large tracts of lowland and hill rainforest, and usually lives at treetops. It can be seen in tall secondary forest and while crossing more open habitats. It is visible up to 1,400 metres of elevation. 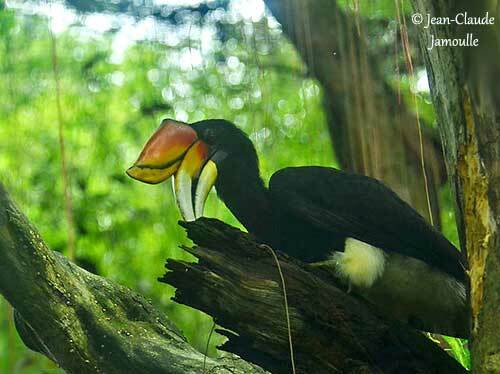 The Rhinoceros Hornbill’s hollow casque may amplify the calls that can be heard throughout the rainforest. It produces a series of short, resonant “rroh” calls, often given by both mates on two different pitches, while perched or in flight. The flying bird also gives a two-note “rroh-yaw” with more yelping second note. The Rhinoceros Hornbill feeds primarily on various fruit, but it also takes arthropods, lizards, snakes, tree-frogs and small mammals. They may forage in flocks outside breeding season, but they usually feed in pairs. Most items are swallowed whole, whereas larger items may be broken up by removing fruit husks or insect wings. Sticky fruits may be wiped on a branch or the ground before to be eaten. The Rhinoceros Hornbill is monogamous and pairs for life. 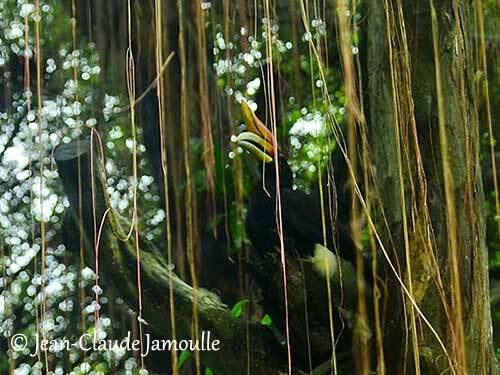 Like in numerous Hornbills, the female spends long time in the nesting hole where she lays the eggs and incubates. During this period, she usually moults both rectrices and remiges. The male provides all the food to the female and the young. The female completely depends on male throughout the nesting cycle. The Rhinoceros Hornbill is sedentary during the breeding season. Outside this period, they may move over long-distances in search of food, especially fruiting trees. Immature birds usually move in flocks. 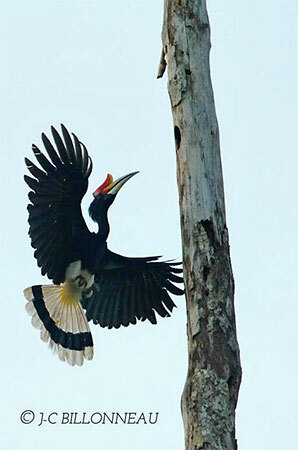 Hornbills usually fly with rather slow, deep wingbeats interspersed with short glides. In the largest species, the wingbeats make a loud noise produced by the air rushing through the flight-feathers. The Rhinoceros Hornbill lays the eggs in January, March/June, September and November. It nests in natural cavity, a hole in tall tree between 9 and 15 metres above the ground. The nesting ritual is typical of these birds. The female enters the tree cavity, and both mates seal the entrance with a paste including fruit, mud and faeces prior to the laying. The entrance hole is usually an elongated slit through which the male provides food to female and young. She lays 1-2 eggs and incubates during 40 days (37-46 days). The female moults both tail and flight feathers after the laying. The male feeds her by regurgitating various food items. When the chicks are large enough, the female breaks free. Then, both parents and young seal again the nest entrance. The adults feed and care for the chicks until they are able to break out of the cavity on their own. They fledge about 78-80 days after hatching and take their first flight. They still depend on parents for six months outside the nest. 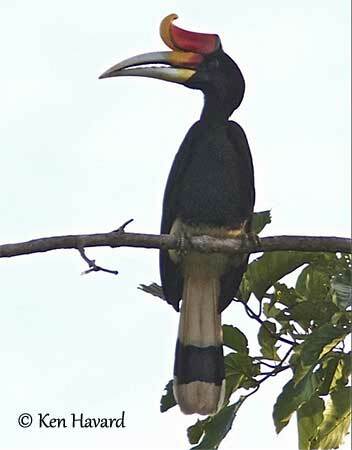 The Rhinoceros Hornbill is threatened by increasing commercial and illegal logging involving degradation of forests, and by agriculture expansion in lowlands. It is traditionally hunted for food and hat feathers in Borneo. The casque can also be carved into an ornament. The population size is unknown, but it is suspected to be declining. The Rhinoceros Hornbill is currently considered Near Threatened.